This article is about a Governorate in Yemen. For other uses, see Hadhramaut (disambiguation). 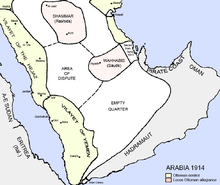 Hadhramaut or Hadramawt (Arabic: حضرموت‎ Ḥaḍramawt) is a governorate of Yemen. Lying within the large historical region of Hadhramaut, it is the country's largest governorate. The capital of Hadhramut is the city of Mukalla. Other cities in Hadhramaut include the historical towns of Shibam, Sena, Seiyun, Tarim, and Ash Shihr. It was badly hit by rainfall during the 2008 Yemen floods, which left thousands homeless and many buildings shattered. The Socotra archipelago was transferred from the Adan Governorate to the Hadhramaut Governorate in 2004. It was subsequently separated to form the newly created Soqatra Governorate in December 2013. ^ "Statistical Yearbook 2011". Central Statistical Organisation. Retrieved 24 February 2013. This article about a location in Yemen is a stub. You can help Wikipedia by expanding it.